Right-wing protesters demonstrating near Downing Street handed out flyers today claiming to be in favour of child abuse, pensioners living in poverty and charity corruption. 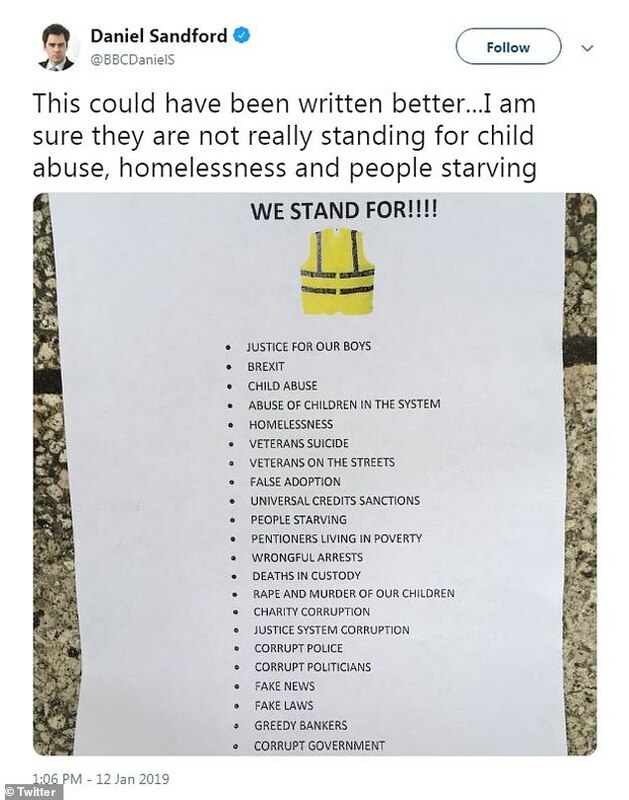 In a poorly-worded missive entitled ‘UK Yellow Vests and what we stand for’, the author shows a remarkably poor knowledge of the English language. The top demand was ‘justice for our boys’ followed closely by ‘Brexit‘. However third on the list things they stand for is ‘child abuse’. They continue their list of things they support with the ‘abuse of children in the system’, ‘homelessness’ and despite their earlier support for the armed forces, they claim to stand for ‘veterans suicide’ and ‘veterans on the streets’. They also support ‘universal credits sanctions’ and ‘people starving’ followed by ‘”pentioners” living in poverty’. Twitter users accused the people behind the flyer of having a poor knowledge of the English language. Previous Post:Brit Awards 2019 – what time is Brit Awards nominations show on and who are the nominees?